Today’s expanding disaster landscape demands crisis managers to configure their organizations to handle a wider range of extreme events. This requires more varied capabilities, capacity and delivery of services. The article proposes that crisis managers must move away from organization-centered planning to a system-wide approach for preparedness. 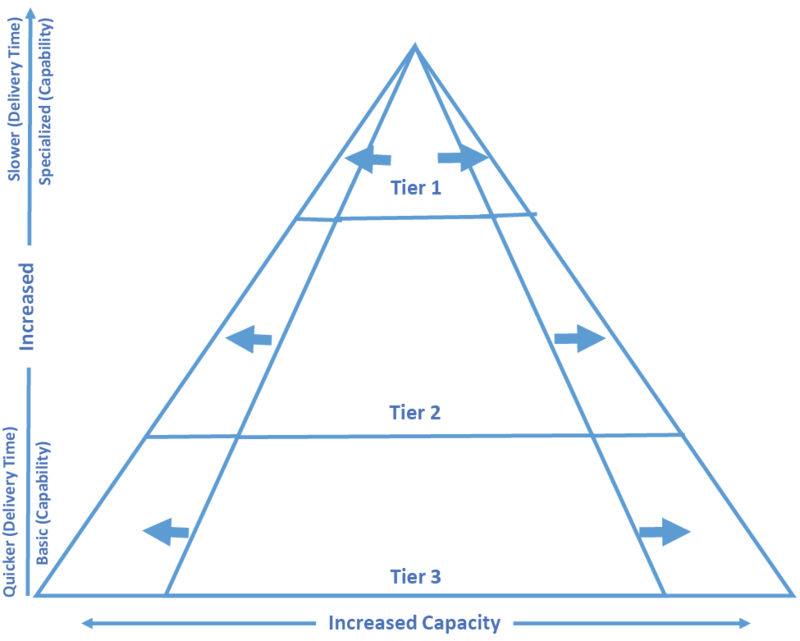 We lay out the limitations of using the current tiered response triangle for planning and argue for implementing a system-wide approach by using a Tiered Response Pyramid to increase response capabilities and surge capacity for large scale disasters. The tiered response pyramid offers crisis managers a way to visualize multiple response options that leverage each other’s resources and create a more resilient response system for complex events. Natural disasters, terrorism, violent extremists, industrial and transportation accidents, cyber-attacks, infrastructure failures, and utility disruptions are some of the diverse challenges crisis managers are called to address. This broadening disaster landscape requires crisis managers to configure their response organizations to handle a wider range of extreme events, meaning that they need more varied capabilities, capacity and delivery of services. However, even as they have diversified their resources, crisis managers have seen responses outstripped by the overwhelming demand and cumulative effects of extreme events. This article offers a system-wide approach to crisis management planning that seeks to decrease the fragility of current response capabilities during large scale disasters. To assist crisis managers in overcoming response limitations, we argue that crisis managers must move away from organization-centered planning to a system-wide approach for building crisis response capacity, capabilities, and delivery. The article lays out the shortcomings of using the current tiered response triangle for planning. We argue instead for crisis managers to enhance their organization-centered tiered triangle by implementing a system-wide Tiered Response Pyramid to increase response capabilities and surge capacity during large scale disasters. The next crisis will come as a shock in timing, location and form, but how crisis managers respond should not be a surprise. To avoid insufficient responses and poor coordination, crisis managers must not only look inward at their own organization, but must also look outward at the whole system’s capabilities and capacity. The Tiered Response Pyramid is a tool for crisis managers to visualize a system-wide response to disasters. In examining what are the operational limits or breaking points along a response fragility curve, two important points of analysis for organizations to consider are highlighted. This evaluation, according to Yaneer Bar-Yan, must consider the scale and complexity of the incident. Large scale events will require more capacity, while complex events entail more capabilities.10 Extreme events are both large and complex, which requires both specialized skills and a surge of resources. But how can organizations further develop capability and capacity to withstand greater amounts of stress? In other words, how can an organization change their “fragility curve” for various crises? Capacity—How many resources are available? Super-Storm Sandy illustrates why crisis managers need to evaluate response across all three dimensions. The destructive wind and storm surge caused the loss of electric service to millions of people on the East Coast.13 Electrical power companies had the capability to restore power, but lacked the capacity locally and regionally to manage such a wide spread outage. Utility resources from the West Coast were brought in to meet the capacity needed to restore power, which changed the delivery timing. It took time to move these additional resources into the disaster area. To understand why a response succeeds or fails one must evaluate all three elements. These operational limits are important to consider for any response activities, such as search and rescue or hazardous material spills. In order to avoid potential failure points or response chain disruption, crisis leaders need a deep understanding of the evolving risk environment to compare their response abilities to the demands of potential crises. Leaders use intelligence briefings and scenario planning to increase their understanding of the risks. However, the potential risks won’t be clear cut because “crises are characterized by the absence of obvious solutions, the scarcity of reliable information when it is needed, and the lack of time to reflect on and debate alternative courses of action.”14 Thus, surge capability and capacity must be built with a degree of flexibility in mind that allows for uncertainty in the response requirements. In order to withstand the demands of extreme events, crisis managers need to strengthen response systems by leveraging an approach that provides adaptive and cost effective solutions. Identifying where an organization’s response chain breakdowns might occur is a critical part of planning and requires crisis managers to determine their response needs. Such knowledge then can be used to build capacity to withstand additional stress before failing. Understanding these limitations at the outset provides crisis managers with the opportunity to redesign capabilities and capacity that can better withstand the cumulative stress of extreme events. To address the expanding response needs, as well as economic realities, first responder organizations have leveraged a tiered response approach to identify capability and capacity needs. 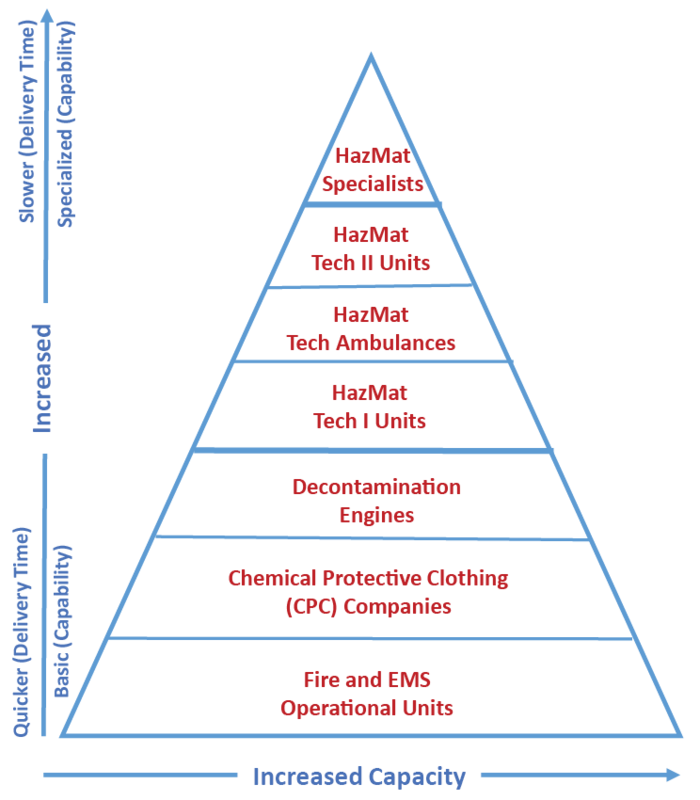 This tiered organization-centered approach for terrorism and emergency preparedness was first proposed by the New York City Fire Department (FDNY) in their 2004 Strategic Plan.15 Since then, tiered response has become a guiding principle for Homeland Security.16 The Tiered Response Model divides mission responsibilities into layered groupings with each subsequent layer containing resources trained incrementally to a higher response capability.17 Thus, a tiered response model is shaped as a triangle; where many more people are trained with basic-level skills and provide support for those with specialized skills allowing the organization to boost overall capacity. The vertical axis represents an increase in capability, while the horizontal axis indicates greater capacity. The tiered response model was adopted by many crisis managers because it creates operational and economic efficiencies. It is cost prohibitive to train everyone to the specialist level. Even if funding were available, many essential roles needed in a hazardous material response or other responses do not require specialist skills. Instead, a variety of units, with incremental proficiencies can establish an incident response that is highly effective, economically efficient and sustainable.19 This tiered response model applies most often to a single organization’s response skills and/or resources. It is applied sometimes across organizations sharing geographic proximity and/or common funding by emergency managers. However, each organization response is structured mostly around their capabilities. There are limitations, however, in the tiered response model when events occur outside the normal routines, such as those requiring a different mix of capabilities, additional capacity or faster delivery of resources. These inadequacies can come from what was excluded in the initial planning phase or can evolve over time based on changing conditions. For example, in the latter case, as the number of fires decreased, the fire service has taken on more and more emergency medical roles to meet the evolving medical needs of an aging population. Regarding the former, initial planning can fail when crisis managers only consider the routine level of staffing for the tiers rather than taking into account peak demand. A few simple modifications or updates to the existing tiered response triangle could address these issues and increase flexibility and effectiveness within an organization. Rebalancing is the redistribution of resources from one tier to another to meet the changing needs. For example, New York City Police Department’s (NYPD) Emergency Service Units (ESU) are specially trained SWAT teams that have a finite capacity to protect the city against multiple terrorist attacks. To supplement these teams, NYPD created a technician level tier by moving officers from patrol into several heavy weapons teams (Strategic Response Groups). By doing this, NYPD rebalanced their tiered response triangle by subdividing a tier to increase protection without hiring new officers. Not only can rebalancing impact capability and capacity, but it can significantly impact delivery. Having more people geographically dispersed with particular skills increases the speed with which resources can reach an incident. It is important to regularly re-access and rebalance according to the evolving risk landscape. Rebalancing can mean additional cost for extra training and equipment. However, there are considerable cost savings if overall staffing remains the same. When economically feasible, using the tiered response model to rebalance is a good way to update and enhance an organization’s overall response capabilities, capacity and delivery. For larger-scale incidents, organizations often are not able to address the response needs by just rebalancing their tiered response model. Daily tiered capacity is outpaced by response needs in a crisis. For these incidents, organizations should examine how their tiered response model can be expanded to meet these needs. For example, how would an organization surge to meet the effects of a powerful tornado that trapped many people in the collapsed buildings? In this case, crisis managers would want to expand their capacity at each tier as opposed to rebalancing across tiers. Expanding a tiered response model—without permanently hiring more people—requires bringing into work those members who are off-duty to supplement the response. This is accomplished through a recall policy that allows an organization to increase response capacity by recalling groups of off-duty people within one or more tiers, thus expanding the tiered response outward. Recalling allows an organization to add to the number of trained people on-duty during a particular incident, taking advantage of their specialized training and experience. One element that often needs to be considered ahead of time in a recall is the availability of extra equipment. For example, if a response organization plans to recall members skilled in rescue techniques, they will need to have additional rescue equipment available for these individuals to perform their roles. This can be accomplished by having fully functional spare equipment or by repurposing equipment. During the Northeast Blackout on August 14, 2003, FDNY added 25 Rapid Response Vehicles by repurposing hazardous material support trucks, each with two firefighters to respond to calls of people trapped in elevators. Recall policies can be effective in expanding capacity. However, using total recall policies to bring in all off-duty personnel has significant limitations in that it creates a surge that is sustainable for only 12 to 24 hours because there is no one to relieve the people on duty. On the other hand, a partial recall reduces the initial surge capacity, but allows for operations to continue for an extended period. Generally, to operate 24 hours / 7 days a week, 25% of a work force is on duty at any one time with 75% off duty. To create a sustainable surge, an organization can pull in an additional 25% of personnel, which doubles the number of people on-duty; the remaining 50% of off-duty members are held in abeyance and will be used to relieve of the on-duty crew (switching every 12 hours). The ability to recall personnel and maintain uninterrupted services is referred to as a sustainable recall. Organizations that do not have 24/7 responsibility can often expand their tiered model with a total recall because natural rest periods exist. Without adequate rest, operating personnel will quickly become ineffective and burn out. Based on particular incident needs, agency leaders can adjust the resources at the organizational level to have a tiered response model that is balanced and sized appropriately to address the crisis. Rebalancing and recalling are useful modifications that address some gaps created in the current tiered response model, especially around evolving crisis response needs and addressing moderate capacity shortages. However, the crisis response required for many catastrophic events – from Hurricane Andrew (1992) to Super Storm Sandy (2012) – could not have been addressed by a single organization rebalancing or recalling; the response to such events requires multiple organizations or a system-wide approach. In addition, the organization-centric approach fails to address cost issues associated with overlapping resource investments and those associated with effectively identifying neglected resource needs. Thus, considering a system-wide vs. organization-centric approach in the planning stages could help identify the capabilities, capacity and delivery these organizations will collectively provide to the response effort. In preparing for these extreme events, it is important to view the overall response, not as many individual organizations each with their own tiered response model, but rather as one Tiered Response System created through inter-agency collaboration and coordination. Emergency management organizations that coordinate municipal or regional response have emphasized this concept of multiple agency response. However, this shift in optimizing from a single organization’s response to a multi-organizational response can be confusing when the same triangle diagram is used for planning within a single organization and multiple organizations. The tiered response triangle does not create a way to plan for resources at the system level across organizations with varying capabilities or delivery. 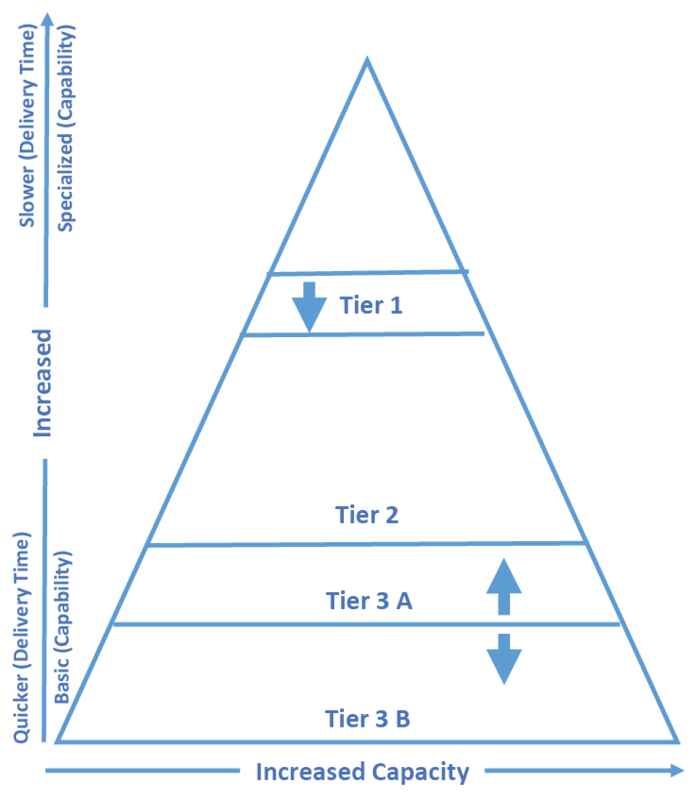 To support the system-wide approach, the two-dimensional Tiered Response Triangle is reshaped into a three-dimensional Tiered Response Pyramid, which can incorporate other groups. Establishing a system-wide approach allows crisis managers to capture important depth at the tier level. The reshaping of the triangle into a pyramid helps a crisis manager to consider the holistic response, leveraging local, regional, non- governmental organizations (NGO), the private sector, volunteers, as well as other national and international assets to increase surge capacity, capabilities and delivery. Moving towards a Tiered Response Pyramid allows organizations to consider not only their own core competencies, but also other agencies’ crisis mitigation capabilities and capacity. 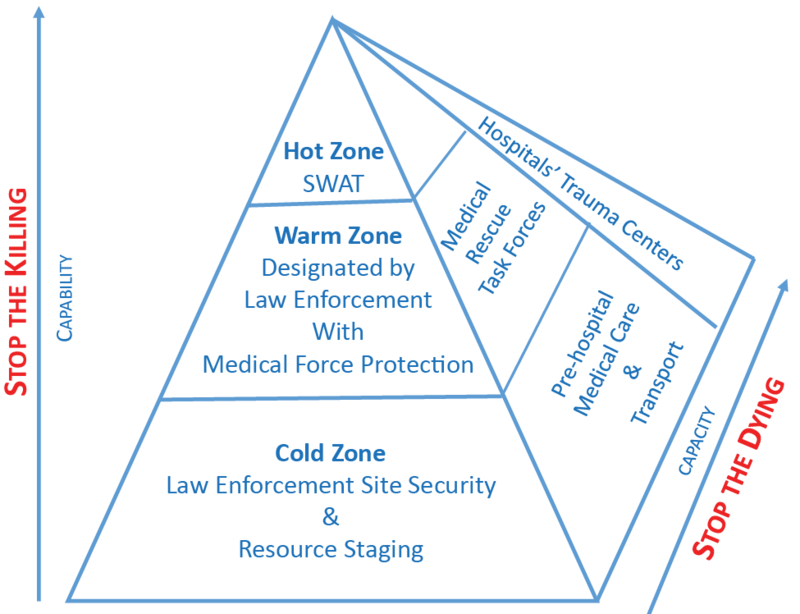 Using the tiered response pyramid, Incident Commanders and Emergency Operation Centers can better visualize the system-wide response capabilities and anticipate response time as additional capabilities requested are often more specialized and drawn from farther away. When done as part of pre-incident analysis, it drives crisis managers to think more systematically about response needs and resources at the system level across capabilities, capacity, and delivery. This system-wide approach is not entirely new; it has been used in emergency management planning. However, the scope has remained limited. For example, acknowledging that future large-scale incidents similar to Super Storm Sandy require more surge capacity than is locally available, New York City’s FDNY and Office of Emergency Management (OEM) engaged with the National Guard in a tiered system-wide solution. NYC developed a memorandum of understanding (MOU) for the New York State National Guard to respond during disasters. The MOU defines three key elements: 1) the requesting process, 2) a list of National Guard capabilities, the amount of resources needed, and how long it will take to deliver the assets, and 3) how to integrate the National Guard into the incident management systems.21 The National Guard is now depicted as part of the surge capacity in New York City’s Tiered Response Pyramid. This system-wide approach with the National Guard can also be used by law enforcement to increase security across a geographical area. The Tiered Response Pyramid is not just about organizations making agreements with each other, but it is rather about shifting the mindset of planning to system-wide approach. The national urban search and rescue program is an example of this coordination and management mindset at the system-wide level. Several fire departments nationally have heavy rescue and medical rescue capabilities that perform local search and rescue activities, as well as national activities when demand exceeds local capacity. These smaller response groups are combined to form regional Urban Search and Rescue (USAR) teams, which are part of the national USAR program under FEMA.22 If a disaster requires more than a local and state response, FEMA will provide a national response, which occurred on 9/11 when eight USAR teams were sent to World Trade Center and four deployed at the Pentagon.23 Surge capacity is further increased by engaging international USAR teams, which was demonstrated with the international response to Haiti after the earthquakes. This system-wide response has been effectively used for years by USAR teams; however, it remains largely limited to specialized teams, rather than being expanded to many other first responder activities. 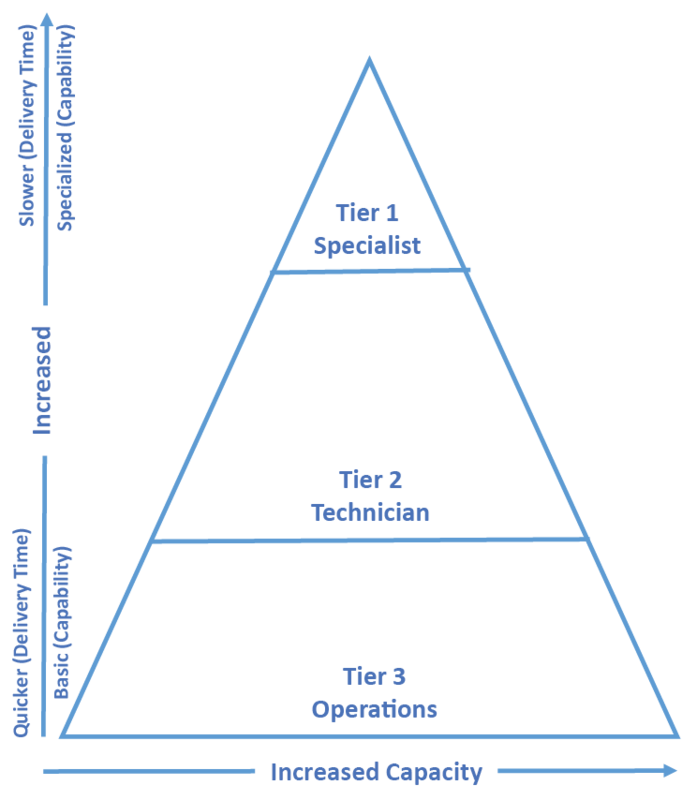 The Tiered Response Pyramid not only allows communities to increase capacity, but it also makes available specialized capabilities that local communities would generally not have as part of their response, such as radiological experts in case of a radiological or nuclear incident. Similar scientific experts in bio-terrorism or pandemics are also useful to include in a system-wide approach. Organizations at the local, state, tribal and federal government can use the tiered response pyramid to address identified gaps. The system-wide approach not only allows communities to leverage resources; it also allows people who work in these specialized groups to gain experience and knowledge that they would not have if they only served a local community. A tiered response system recognizes at the outset the reality that no one agency or jurisdiction has enough resources for extreme events. By shifting to a three-dimensional tiered response pyramid, crisis managers create greater surge capacity, while making resource sharing more commonplace. A system-wide approach fills capability and capacity needs within individual organizations by closely linking the system together. The Emergency Management Assistance Compact (EMAC) is a national mutual aid agreement that enables states to share resources, which could be used to create a tiered response system solution.24 This is assisted by national resource typing, which provides an understanding of equipment and competencies. These programs provide an easier way for organizations to start shifting from a tiered response triangle to a tiered response pyramid. Moving to a tiered response pyramid multiplies the number of response options as many more resources combinations can be tapped allowing communities to reshape their capacity, capabilities and delivery. Crisis managers who use the tiered response pyramid as an analytical tool will be better able to visualize their preparedness strategies and build more resilient responses. State and regional homeland security agencies along with regional FEMA offices can help map local communities’ response capabilities, as well as regional and national capacity. The tiered response pyramid allows organizations to rebalance capabilities for greater day-to-day operational efficiency, while reshaping the organization’s overall capacity, capabilities and delivery to handle large-scale incidents. When transitioning to a tiered response pyramid, it is important to consider what capabilities are necessary, how much is required (capacity), and when these resources are needed (delivery) to determine who might be best suited to own and share a particular capability. In 2013, the American Heart Association reported 359,400 out of hospital cardiac arrests. Even with all the advances in emergency medical services (EMS), the survival rate was a mere 9.5%.25 Some crisis managers have started to look at problem not just from an organizational framework, but from a system-wide perceptive. Cities such as Seattle have dramatically increased the survival rate from heart attacks to 62% using a system-wide approach.26 They focused on training citizens in cardio pulmonary resuscitation (CPR), giving 911-phone instruction on CPR to callers, and providing automatic external defibrillators (AED) in many locations, so someone going into cardiac arrest can receive care quickly by educated citizens until the paramedics arrive. The paramedics then provide more specialized medical care, as well as transport to the hospital where the person receives definitive medical care. Each part of this response sequence or response chain is an integral part of an effective response and highlights how a system-wide response can expand capabilities, capacity and delivery. Varying risk probabilities across communities and geographic areas can suggest where it makes sense to fund these resources. For example, The Department of Homeland Security has funded response capabilities to address terrorism risks New York City faces, but those funds end up enhancing the surge capacity more broadly. During recent floods and snowstorms in upstate New York, FDNY sent rescue and incident management teams as a regional asset. In the aftermath of Hurricane Katrina, a 300 person firefighting team from FDNY was sent to New Orleans to assist the New Orleans’ Fire Department. Implementing a tiered response pyramid requires more initial collaboration and coordination than the tiered response triangle. However, the results for these efforts are an expanded ability to respond to potential crises. To transition to the tiered response system, crisis managers need to 1) perform a needs assessment, 2) conduct a tiered response analysis, and 3) apply the three “R’s” of the tiered response pyramid— rebalance, recall, and reshape. In developing this initial list of threats, it is important to consider common or routine threats, as well as threats posed by extreme events. Howitt and Leonard describe extreme events or novel events as unfamiliar events occurring at an unprecedented scale that outstrips available resources, making routine responses inadequate and at times even counterproductive.28 Due to the wide range of novel events, crisis managers will want to make sure to invest adequate time in brainstorming around what could happen, yet not to be so hubristic to think they can predict all scenarios. Crisis managers also might find using existing tools and methodologies, such as those laid out in Homeland Security’s Threat and Hazard Identification and Risk Assessment Guide (THIRA), helpful in creating a full list of threats and prioritizing those threats that are more likely to happen. One of those threats that rise to the top of the list is an active shooter incident. Once threats have been identified, crisis managers need to do an analysis of tiered response capabilities, capacity, and delivery for addressing each potential incident. Crisis managers should create a grid that lists all the capabilities needs mapped against the capacity numbers and delivery times. For example, an active shooter incident requires a dual mission approach of law enforcement engaging the shooter to stop the killing and emergency medical personnel quickly providing care for the injured to stop the dying (see Figure 6). From this analysis, a list of identified capabilities needs is created by mapping the crisis response skills (e.g., SWAT teams to engage the shooters, force protection for medical personnel, medical rescue task force to control bleeding and extract victims, trauma doctors and nurses to operate) and equipment requirements (e.g., long guns, ballistic protection, tourniquets, hemostatic clotting agents, trauma center supplies) for this threat. Then these capabilities are tagged with the capacity and timing requirements. Based on the identified gaps, crisis managers can build robust tiered response system-wide requirements, which can then become a tiered response pyramid by applying the three “R’s” of the tiered response pyramid. To fill in the tiered response pyramid, the crisis manager should consider multiple potential solutions, as well as multiple partners to close the gaps. Crisis managers have significantly more options available for them with the pyramid than with the triangle. They can consider internal modifications (rebalancing and recall), as well as external partnerships (reshaping). As potential partnerships are identified, it is important to consider which control, funding, and deployment models make the most sense for various capabilities. The tiered response pyramid reframes crisis response activities from the organizational level to the system level. It offers a way to visualize crisis management that is no longer insular, but engages other crisis managers in building partnerships. The interconnectedness required to develop a tiered response pyramid is the underlying basis for disaster planning and response. This system-wide tiered response proved its value on October 23, 2014, when Craig Spenser, a doctor who treated patients in Western Africa with the group Doctors without Borders, became ill with Ebola and had to be rushed to Bellevue Hospital in New York City by ambulance. Multiple organizations mobilized by deploying a version of the tiered response pyramid for patient care and disease mitigation. FDNY dispatched a HazMat Chief, HazMat Ambulances and HazMat Tech Units to the doctor’s residence and used personal protective equipment originally bought for chemical terrorism as bio protections to transport the patient by ambulance to the hospital. The patient was then handed off to the hospital staff in bio protective gear and within a short period of time was receiving treatment that saved his life. The system-wide tiered response contained this potentially deadly epidemic and proper decontamination procedures ensured the safety of all emergency responders. The structure of the pyramid allowed seamless adaptation between first responders and hospital. This Ebola case demonstrated the flexibility of the tiered response system to leverage core competencies and adapt to novelty. Making the tiered response pyramid work requires crisis managers to think about the entire response system’s capability, capacity and delivery. Peter Senge defines this as “system thinking,” which allows one to see the underlying structures of complexity and the interrelationships of the system parts.30 Crisis managers can apply system thinking to preparedness and response by looking at the whole response pyramid. Without system thinking, the Ebola response would have been fragmented and unable to adapt, increasing the potential of spreading this dangerous disease. When confronted with extreme events, success depends on not just having a list of capabilities, but a flexible response system, which crisis managers can adapt for new crises. It is about being able to recognize and respond to changing patterns by altering the system’s behavior.31 Response agility is composed of balanced resources in each tier and the ability to adapt to scale, complexity and novelty. Former four star General, Stanley McChrystal argues that robustness is achieved by strengthening parts of the system, while resilience is the results of linking elements that allow resources to reconfigure or adapt to a changing environment.32 The tiered response pyramid is a tool that allows crisis managers to build robust and resilient response systems by strengthening the tiers and reconfiguring the shape of their response fragility curve to a system-wide network for managing major disasters. When US Airways, Flight 1549 (Miracle in the Hudson) did an emergency landing in the icy cold waters of the Hudson River, all 155 passengers and crew were rescued because of an agile tiered response system that emerged as part of collective innovation. Together, New York Waterways’ Ferries, FDNY Fireboats, U.S. Coast Guard small boats and NYPD Helicopters remained flexible and aligned their agencies’ core skills to improvise on their water rescue operations for an incident they had not had specifically trained for or discussed collectively. The system-wide tiered response formalizes practices that have started to evolve both at the local and national levels. By providing a standardized structure, the pyramid offers crisis managers a common lexicon and an approach to visualize multiple response options that leverage each other’s resources and create a more resilient response system. 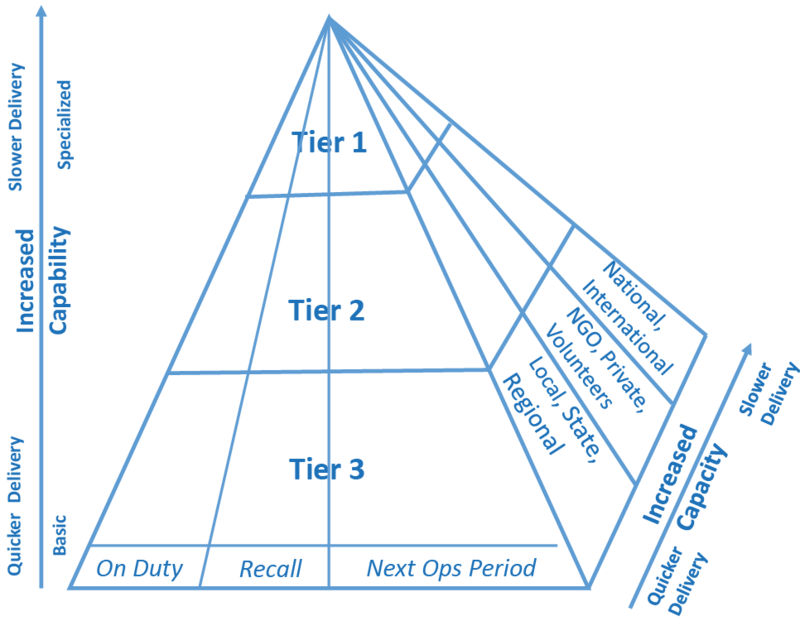 The system-wide tiered response pyramid allows leaders to customize their organizational tiers and innovate collectively in order to be better prepared for novel and complex events. The tiered response pyramid gives crisis managers the ability to rebalance and expand, as well as reshape their response to adapt to an ever changing world of emergencies and disasters by changing the shape of their response fragility curve. Joseph Pfeifer is an assistant chief for the New York City Fire Department and founding director of FDNY’s Center for Terrorism and Disaster Preparedness. He is also a visiting instructor for the Center of Homeland Defense and Security at NPS, a senior fellow at the Program for Crisis Leadership at the Harvard Kennedy School, and a senior fellow at the Combating Terrorism Center at West Point. He holds masters degrees from the Harvard Kennedy School, Naval Postgraduate School and Immaculate Conception. He is published in various books and journals and can be contacted at: joe_pfeifer@hks.harvard.edu. Ophelia Roman recently was a manager in Deloitte’s Crisis Management Practice. She served on Mayor Bloomberg’s Special Initiative for Rebuilding and Resiliency after Superstorm Sandy, and has also worked multiple times with New York Fire Department starting in 2009. She holds master degrees from Harvard Kennedy School and Harvard Business School. 1 Department of Homeland Security, National Response Framework (Washington, D.C.: Government Printing Office, 2013), 1. 2 Department of Homeland Security, National Preparedness Goals (Washington, D.C.: Government Printing Office, 2011), 11. 3 Louise K. Comfort, “Rethinking Security: Organizational Fragility in Extreme Events,” Public Administration Review 62 (September 2002): 102. 5 National Institute of Standards and Technology, Federal Building and Fire Safety Investigation of the World Trade Center Disaster: The Emergency Response Operation (Washington, D.C., 2005). 6 Congressional Bipartisan Committee, A Failure of Initiative: Final Report of the Selective Bipartisan Committee to Investigate the Preparation for and Response to Hurricane Katrina (Washington, D.C.: U.S. Printing Office, 2006), 14-15. 7 Swiss Re, Sigma World Insurance Database: (http://www.sigma-explorer.com/ Accessed 7/10/15). 8 Donald Rumsfeld, “21st Century Transformation of U.S. Armed Forces,” Speech, National Defense University, Fort McNair, Washington, DC, January 31, 2002, (http://www.defenselink.mil/speeches/2002/s20020131-secdef.html). 9 Reid Sawyer & Joseph Pfeifer, “Strategic Planning for First Responders: Lessons Learned from the NY Fire Department”, In R. Howard, J. Forest, and J. Moore (Eds. ), Homeland Security and Terrorism, (New York: McGraw-Hill Company, 2006), 246-258. 10 Yaneer Bar-Yan, Making Things Work: Solving Complex Problems in a Complex World, (NECSI: Knowledge Press, 2004), 69. 11 Department of Homeland Security, Threat and Hazard Identification and Risk Assessment Guide (Washington, D.C.: Government Printing Office, 2013), 13. 12 Joseph Pfeifer, “Crisis Leadership: The Art of Adapting to Extreme Events,” Harvard Kennedy School’s Program on Crisis Leadership Discussion Paper Series, (Cambridge, MA: Harvard Kennedy School: 2013), 5. 13 New York City, Hurricane Sandy After Action (New York City, 2013). 14 Robert Bertrand and Chris Lajtha, “A New Approach to Crisis Management,” Journal of Contingencies and Risk Management 10, no. 4 (December 2002): 184. 15 FDNY, Strategic Plan (New York City Fire Department. 2004), 3. 16 Department of Homeland Security, National Response Framework (Washington, D.C.: Government Printing Office, 2013), 5. 17 FDNY, Terrorism Preparedness Strategy (New York City Fire Department, 2007), 14. 18 Department of Homeland Security, National Response Framework (Washington, D.C.: Government Printing Office, 2013), 7. 19 FDNY, Terrorism Preparedness Strategy (New York City Fire Department, 2007), 14. 20 FDNY, HazMat Tiered Response to WMD Incidents, (New York City Fire Department, 2015). 21 MOU between FDNY, Office of Emergency Management, and the National Guard, Engaging the National Guard During a Disaster (2013). 22 FEMA, USAR. (https://www.fema.gov/about-urban-search-rescue#. Accessed 2/16/15). 23 FEMA, FEMA Mobilizes Twelve Urban Search and Rescue Teams, (https://www.fema.gov/news-release/2001/09/11/fema-mobilizes-twelve-urban-search-and-rescue-teams. Accessed 7/26/15). 24 FEMA, Emergency Management Assistance Compact (http://www.emacweb.org/, Accessed 2/16/15). 25 American Heart Association, Heart Disease and Stroke Statistics – 2013 Update (http://www.heart.org/HEARTORG/General/Cardiac-Arrest-Statistics_UCM_448311_Article.jsp, Accessed 7/10/15). 26 King County Public Health, King County Has the World’s Highest Survival Rate for Cardiac Arrest (http://www.kingcounty.gov/depts/health/news/2014/May/19-cardiac-survival.aspx, accessed 7/26/15). 27 Peter Schwartz, The Art of the Long View, (New York: Doubleday Dell Publishing Group, Inc., 1991), 4. 28 Arnold M Howitt & Herman B. Leonard, with David Giles (Eds. ), Managing Crisis: Response to Large-Scale Emergencies, (Washington, D.C.: CQ Press, 2009), 275. 29 Herman Leonard, Christine Cole, Arnold Howitt, & Philip Haymann, Why Boston Was Strong: Lessons Learned from the Boston Marathon Bombings, (Cambridge: President and Fellows of Harvard College, 2014), 28-29. 30 Peter M. Senge, The Fifth Discipline, (New York: Doubleday Publishing, 2006). 68-69. 31 Steven Johnson, Emergence: The Collective of Ants, Brains, Cities and Software, (New York: Scriber Publishing. 2001), 103-104. 32 Stanley McChrystal with Tantum Collins, David Silverman, and Chris Fussel, Teams of Teams: New Rules of Engagement for a Complex Worlds, (New York: Portfolio/Penguin, 2015), 80. An excellent article! Fragility curves are well-known in the literature, but they are called exceedence probability distribution curves. Thanks Ted. Your positive comments means a lot and I appreciate the additional term. First, I wish to make it very, very clear that I very much enjoyed this article on the “…Tiered Response Pyramid…”, and I have shared the document with several of my co-workers. However, I also wanted to take the opportunity to provide a little feedback, which I believe may be useful, especially to expand upon this endeavor in future discussions and/or articles. 1.) Private citizens (and their resources), especially any members of the public who are on-site at the time of the disaster (but also the sustaining volunteers), will often make very significant contributions to the outcomes of a disaster response and should therefore be included in the planning and coordination considerations (e.g., The citizens who would employ live-saving strategies in the example from Seattle; The citizens who would employ live-saving strategies of President Obama’s “Stop the Bleed” program; and The private boats and other private resources that participated in the rescue efforts during the “Miracle on the Hudson” example). 1.a.) Therefore, since the actions of private citizens are often of critical importance to the outcome of the disaster response, especially in the earliest hours of major disasters, and this article is primarily about the planning/coordination associated with major disasters, it is my recommendation that future planning/coordination illustrations using the pyramid find an appropriate way add the “citizen response” element, such as having a foundation layer or adding “citizen volunteers” to the Operations layer. 2.a.) Note: For L.A., CDC has told us that we will start to receive multiple truckloads of these MCM assets in as little as four hours from the time of the approved request, which is almost as fast as law enforcement can call in a local crime scene specialist from home and have him/her actually equipped and available at the scene of a major crime. 3.) Finally, in the article’s active shooter illustration they mistakenly did not show the law enforcement officers immediately going into the Hot Zone of the Active Shooter incident to “Stop the Killing”, and instead reflected that they (field police officers) would wait for SWAT to arrive in order to clear the Hot Zone. While this was once true, it is no longer true. 3.a.) Note: I realize that in the response to the Orlando tragedy, there was a return to the practice of waiting for SWAT after the earlier efforts by the initially responding officers failed, but the Pulse Night Club incident was a special, non-typical case that involved numerous hostages, the claim of a bomb by the suspect, the significant concealment of the armed suspect, on-going rescues of some of the victims from inside the club, etc.. Note: The following two areas of my professional background are being offered here to establish that I have some experiences that would serve to justify consideration of my opinions, which include 30 years with LAPD and 12 years in emergency management and logistics with the L.A. Co. Dept. of Public Health. Again, I consider this article to be excellent work, and I look forward to reading any follow up articles and/or comments. Mike, thanks for expanding the Tiered Response Pyramid to include other partners. The idea of this visual tool is for agencies to look beyond their organizations and see the value of working with others. This is especially true when it comes to active shooting incidents to stop the killing and dying. Such a mandate will take multiple agencies of law enforcement (first officer on the scene and SWAT), first responders (Fire and EMS) and hospitals. I agree with everything you are saying. 60-80% of all trauma related deaths occur within the first hour after injury (almost all of whose fate become sealed within those the first 1-25 minutes). While treatment has significantly advanced across all fields of medicine — effectively improving the chances of survival for those who do make it to a MTF — that same 60-80% death rate has been relatively unchanged since the 1970s. There is a significant gap that is largely ignored in civilian pre-hospital trauma realm. So much so, that in a large portion of studies, related to this subject, incorrectly categorized victims as non-preventable, immediate, or “DOA”. This isn’t true, or doesn’t have to be true in the case of DOA. But only if the issue of response time is addressed. It won’t make much of a difference how you tier it if these times stay around 18 – 22 minutes. Until the average conventional first responders can realistically respond in 1-3 minutes, the vast majority of those suffering from massive femoral hemorrhage will continue to die. Same with airway, 6-9, etc. Joe, I absolutely agree with almost everything you gentlemen are saying. Response has to work all the way up the chain, a system like the one in the posted article is extremely important. Also, a resilient community is a fantastic concept. I truly believe once in effect, many disaster situations will have much better outcomes because of the people inherent to the scene knowing what to do. To fill that gap in response. However, I can almost guarantee that there are going to be situations where this produces an outcome much worse. The most important aspect of trauma medicine is the prevention of additional casualties, hands down that is number one, if you or anyone else goes down because of good intentions, not only did the scene get worse, but it most likely did so in a synergistic way. The aspect of adrenaline response plays a critical role in this. In short, you are put into a state of mind where you do not think. You can’t think, or hear or see or process information (consciously). You react, and this reaction typically comes down to what they have been exposed to, relevant to the situation. If a person associates a man with a gun shooting at people, with get away, then they will most likely try and get away. But if someone associates a man with a gun with treat people — even if “get away” or self-safety is taught — Then there is a pretty big possibility that people will run to where treatment is needed. Directly in the sights of the gun men or Into the middle of the road at a vehicle collision, or right into the cloud of toxic or superheated gases. The X. It all comes down to what they subconsciously process is more valuable; self-preservation or their empowerment to save lives. I’ve seen it all too often, that empowerment is unbelievably strong, and people will die because of it. But I also feel that it is absolutely necessary, regardless. I think its important to clearly express that trauma, when it produces immediate life threats, presents a danger to life to anyone else there. Regardless of setting, or mechanism, the scene must be approached as if it presents danger to life. Because it absolutely will. Just in a varying degree. How to get this through to people (really to the point where they understand it and believe it to the core) who have typically never dealt with any kind of strife before? I have no idea. Seasoned military medics can’t even grasp it. Point being is; this solution is needed but without tools and the knowledge to mitigate risks, this solution is going to produce shaky results. I have been working on a solution to this for the past year. I truly believe that it will drastically reduce trauma related deaths by at least 40 – 50% — globally. Without risking bystanders or, first responders. But I need help in doing so. I am wondering if you gentlemen could point me in the right direction. My name is Andrew Dutcher, it a pleasure to see that people are approaching this sensibly both you of seem to be a rare find. Andrew, you bring up so many good points about expanding the Tiered Pyramid System to include civilian, but within the realm of safety. Perhaps, we need a new lexicon for active shooting incidents such as “run-hide-fight-save”. This can piggyback on stopping the bleeding campaign. And to your point, this must be part of people’s subconscious. In extreme events people perform best if they are prepared. We see this when people know where exits are during a fire. Or the most famous branding of preparedness, “stop-drop-and roll”. The challenge for us is to build a system to reduce trauma related deaths that balances stopping the killing with stopping the dying. Our hope is that this article will continue to drive innovative thinking. Let’s continue this discussion. I’m working on a platform that is non-human based. It can respond to scenes such as this in under a minute and effectively treat the leading causes of death produced by trauma. It also will be capable of extracting casualties out of hostile environments. This, in conjunction with the Tiered Pyramid System and a modified form of stop the bleed, seems to fill all the gaps.